Over 1,000,000 units sold, and a consumer OTC favorite. The TENS 7000 2nd Edition provides prescription strength pain relief and is the best valued OTC digital TENS unit on the market today. Powered by a 9-volt battery, this TENS machine is proven to be a powerful, durable, and easy-to-use. The TENS 7000 unit is the preferred device of physical therapists and physicians to relieve common pain. HOW IT WORKS: The TENS unit sends comfortable impulses through the skin that stimulate the nerve (or nerves) in the treatment area. Treatment can be given on demand or via timed therapy sessions up to 60 minutes. In many cases, this stimulation will greatly reduce or eliminate the pain sensation you feel. Pain relief varies by individual mode selected for therapy and the type of pain you are experiencing. In many people the reduction or elimination of pain lasts longer than the actual period of stimulation (sometimes as much as three to four limes longer). The TENS 7000 comes complete with the device, two (2) pair of lead wires, one (1) four (4) pack of reusable electrodes, one (1) 9-volt battery, a quick start guide instruction manual, and a hard carry case. The TENS unit comes with five (5) powerful therapy modes of operation to tackle the toughest common household or exercise related pain. The modes are: 1) Burst 2) Normal 3) Modulation 4) Strength Duration 1 (SD1) and 5) Strength Duration 2 (SD2). Intensity of the device is controlled via two control knobs that allow you to control the stimulation power of the dual channel pulses. Each channel controls 2 electrode TENS unit pads. The package comes with 4 starter electrode pads(colors may vary) of premium quality and will last multiple sessions. Recommended replacement electrodes are the inTENSity brand or TENS 7000 brands. TENS device comes with a 1 year warranty and is supported by the Roscoe Medical best-in-class support team. DUAL CHANNEL TENS UNIT - The TENS 7000 TENS unit provides prescription strength pain relief. The dual intensity muscle stimulator, nerve stimulator, and electric massager has truly independent dual channels that control four (4) TENS unit pads (electrodes) for targeted pain relief. OVER 1M TENS 7000 DEVICES SOLD - A consumer OTC (over-the-counter) favorite back pain relief device for providing immediate and lasting drug-free pain muscle pain relief from back pain, neck pain, tennis elbow, to bursitis. PRESCRIPTION STRENGTH PAIN RELIEF - A favorite device among industry professionals for delivering drug-free back pain relief as well as common ailments including neck pain, carpal tunnel, arthritis, shoulder, knee, elbow, leg and foot pain. MULTIPLE THERAPY MODES - TENS machine comes with multiple therapy modes including: Normal, Burst, Modulation Pulse Massager, Strength Duration 1, and Strength Duration 2. 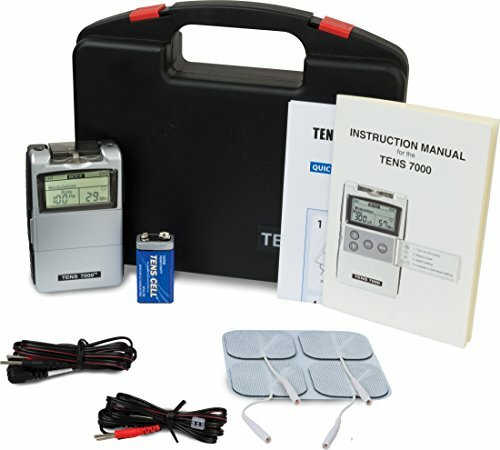 An electrotherapy machine with everything needed for TENS therapy. COMES WITH EVERYTHING YOU NEED - The TENS unit muscle stimulator and electric massager comes complete with the TENS 7000 device, two (2) pair of lead wires, one (1) four (4) pack of reusable premium electrodes, one (1) 9-volt battery, a quick start guide, instruction manual, and a hard carry case.